I’ve glued MDF with a variety of glues, and it never makes a secure joint, at least not for me, but maybe a construction type glue like liquid nails would work. I have a concern about the weight of the MDF as opposed to the strength of the pine, and the strain all that weight is going to put on your hinges and door frame. wouldn’t it be just as cost efective to use 1/4” ply? it would glue well, probably be cheaper, take paint better, and be lighter. Great comments Jerry. I considered thinner mdf and plywood, but I’m routering v groove (simulated tongue and groove) on each side for decoration and the v groove will require the extra thickness. I haven’t worked with 3/4” mdf before and I am amazed at the weight of this stuff. Weight should not be much of a factor (hinge wise) because I’m using sliding barn door hardware where each stile is lag bolted at to the barn door rail. Weight could be a problem on the frame itself, but I added some loose tenons. I’ve got the door ready to insert the panels now, so I really can’t change the design. I’ll used liquid nails on the panels and hopefully the frame can handle the weight. This is what the door hardware looks like. I would leave the panel floating, the MDF will not move but the frame will. If it is 3/4 inch MDF that’s going to be a very heavy door. Also MDF does not glue very well. I’m wondering if I should put in plywood instead of the MDF. But I calculated the weight of MDF in the door at 60.9 lbs. The same amount of 3/4” plywood would be 43.1 lbs. 17.8 lbs doesn’t seem like much of a difference. But if I use 1/2” plywood, the panel weight would be 28.8 lbs. That’s a 32 lb less than 3/4 mdf. But if I cut 1/8 deep grooves back to back in 1/2” ply, I only have a 1/4” thickness where the grooves are. Heavy doors are nothing new. I’m with Loren. When I first started building doors, I swore the hinges couldn’t support them, but I’ve hung entry doors that weigh well over 100 lbs without a hitch. 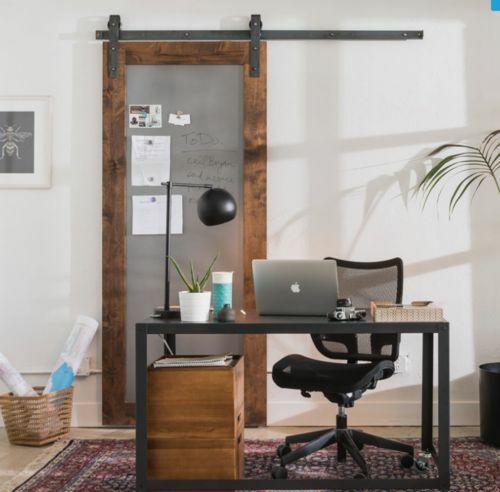 The fact that yours are hanging on barn door hardware makes it even less of an issue. That said, if I were building the door, I’d use alder. Clear or knotty, depending on the look you’re going for. Even if you paint it (aargh) it will look better. The v-groove in the MDF is going to expose the core of the material, which does not paint well. You can seal it, prime it, do whatever, and it just won’t look as finished as real wood. Alder is harder than pine, while still being easy to work and pretty inexpensive. Sorry for butting in, but I couldn’t help myself. I’ll shut up now. If you’re going to paint it, I’d actually recommend poplar. It’s a good stable wood, but much lighter than MDF. I like MDF in its place (like veneer coated for cabinet carcasses). I also don’t think the thinness of the 1/2 MDF routed would be all that bad. If you are concerned, you could try to find a router bit with a wider angle “V” and not cut as deep. Good luck! Thanks for the advice guys. I decided to change the panels to !”x6” pine boards routered to a tongue and groove. Then I’ll loose fit those into the frame. I’m painting the panel boards first. I should have used poplar, but I would have to drive a ways to get it.